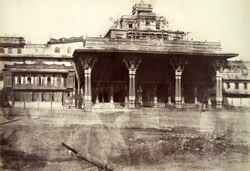 Photograph of the Old Palace at Mysore, taken by William Henry Pigou around 1855. The view shows the east front and the gallery of the Dasara Hall of the old palace, burnt down in 1897. The new Amba Vilas Palace was designed by Henry Irwin and built in the Indo-Saracenic style.